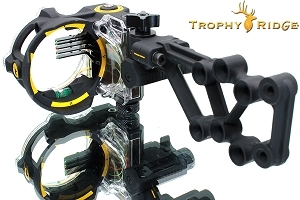 Trophy Ridge React H5, Auto-Adjusting Compound Bow Sighting System, VERY SMART! 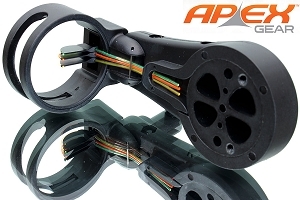 Viper Venom 500 4-Pin Compound Bow Sight, SUPER-STRONG MADE IN AMERICA! 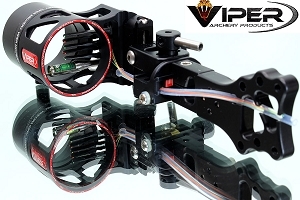 Viper Venom 1000 5-Pin .015" Compound Bow Sight, MADE IN AMERICA! 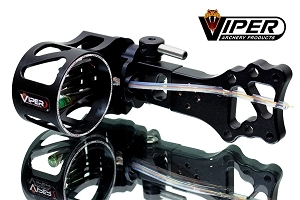 Viper Venom XL 5-Pin .015" Compound Bow Sight, WITH CHOICE OF ZEISS LENS! 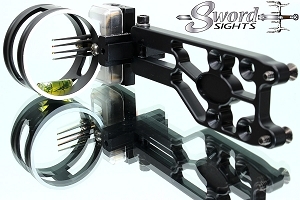 WHAT IS A BOW SIGHT? The sight on a bow serves the same function as the sight on a gun. It tells you where the arrow is pointed. Those tiny little dots in the center of the round sight housing (called "pins") are the aiming points - much like the front sight bead on a gun. Simple. But since arrows don't fly as fast as bullets, the comparison really ends there. Since an arrow flies along at just 300 fps (compared to 2,500+ fps for a run-of-the-mill .308 bullet), judging for distance is critical. The slower flight of the arrow means it flies in a more exaggerated parabolic arc (compared to a bullet anyway). If you're used to shooting guns, you know a small +/- 20 yard change in distance has little effect on the accuracy of the bullet, but a +/- 20 yard change would dramatically affect an arrow's point of impact. An arrow ranged for a 30 yard target might entirely miss a 50 yard target. 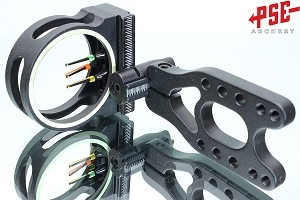 So bow sights usually have multiple pins (or a sliding adjustable pin). Each pin (or pin setting) represents a known yardage. 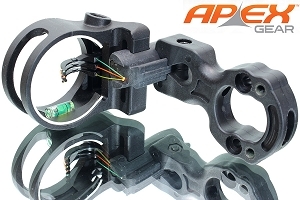 For example, many archers setup their sight pins for 10 yard increments. 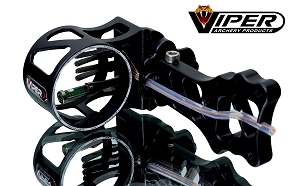 A typical 4-pin layout is 20, 30, 40, 50, but the pins can be set for any distance you like (within the limits of the bow and your skill of course). The top pin is for the closest distance, the bottom pin for the furthest. It's up to the shooter to "set" those pins via trial-and-error testing. If you've never "set the pins" on a bow sight, it's actually rather enjoyable, though it can be time consuming. 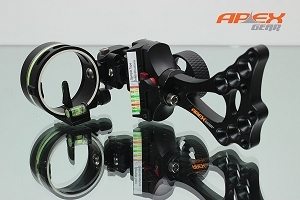 You shoot - you adjust - you shoot again - you adjust again - until each pin is oriented in such a way to point your arrow in the right direction, and compensate for the distances you like. When you go hunting, all you have to do is decide which pin you want to use, based on the estimated distance of your intended target. Big fun! HOW FANCY DOES IT NEED TO BE? 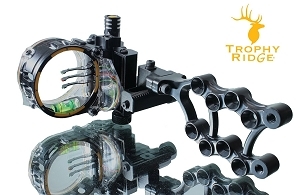 Sights can range from simple $20 plastic models all the way up to intricately complicated gizmos which cost a fortune. On the most basic level, all sights do the same thing. They provide a small brightly colored dot (reference point) in your sight picture so you can aim your arrow. 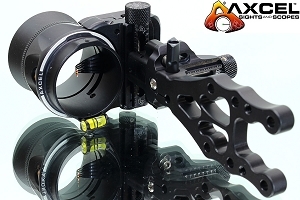 In that respect, all bow sights are the same, but the fancier machined sights can incorporate some premium features you might find useful (2nd/3rd axis adjustments, levels, aiming rings, fiber optics, rheostat lights, micro-click adjustments, magnifying lenses, etc.). If you want to complicate an otherwise simple thing, buying a fancy sight is an easy way to do it. This isn't to say upgraded sights are unnecessary. You may find some of the premium features attractive. 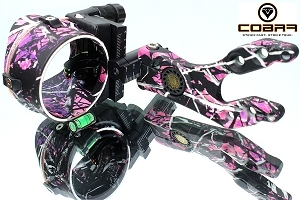 But understand, a fancy sight won't fix a bad bow setup or poor technique. Those pins are still only reference points, no matter how fancy the gizmos illuminating them or holding them in place. Personal choice and price are the key considerations here, but the most popular selling units tend to be the base machined aluminum models in the $40-75 range.